Professor Dave Merrill constructed Arrowhead Ale, a Walthers Cornerstone background building for the HO scale 2018 Jubilee of Trees project. A background building is designed to fit against the backdrop of a layout so it consists of only 3 finished sides and is 2.5 inches deep. Read on as Professor Dave describes the steps he took to build and customize the structure. "Our Jubilee of Trees layout is a free-standing railroad visible from all sides so I decided to use a doll house approach and finish the open inside of the building that would face the edge of the layout." "Plastic models are easy to assemble but even though it was cast in three colors, the colored plastic does not have a realistic appearance. The first task was to paint the components of the model. I removed the windows from the sprues and cleaned away any flash. Then I attached them to a card with double stick tape. I wanted the brick to be one color but I wanted the foundation to be a different color so I masked the foundation with a thin masking tape. I also masked the windows and the cap on top of the walls. Then I airbrushed the walls with a rust colored paint which I thought would resemble old brick. I also airbrushed the windows with a earth colored paint and the roof with grimy black paint. The paint on the walls dried for a couple of days then I removed the tape from the foundation and masked the walls so that I could airbrush the foundation with earth colored paint. I also airbrushed the dock legs and deck with a grey brown paint." "My next task was to add mortar to the embossed bricks. I used the concrete colored paint and squeegeed it into the mortar lines with the edge of a piece of poster board. Using a piece of paper towel, I wiped the concrete colored paint off the brick as much as I could leaving the residual in the embossed mortar lines. It left a stain on the brick that made the brick look even more weathered." "When the walls were dry, after another couple of days. I brush-painted the window sills and the wall cap with a concrete colored paint." "After the paint on the walls was dry I brushed the model with my weathering mix made of a teaspoon of India ink in a pint of rubbing alcohol. This dulls everything and leaves dark in embossed areas giving the model a weathered appearance. Next, I sprayed the walls with Testors Dull Coat." "I then attached the decals for the date, the name of the brewery, and the visitors sign." "Finally, I inserted the windows and doors in the wall as per the instructions and added glass to the windows. With the walls complete I assembled the model as per the instructions." "Detailing the insides of the model was more complicated. The model is not designed to be finished on the inside. My big mistake was to not paint the windows on both sides. The model was already assembled when I realized that the back of the windows and doors were the original green unpainted plastic. Using 4-ply Bristol Board, I made a petition and a second floor. I covered the interior walls of the brewery section with embossed brick paper and the office/attic side with Bristol Board cut out around the windows and doors. To give the structure a more industrial look, I added 1/16 strip wood to form interior framing, rafters, and floor joists. I used a block of wood to raise the floor in the brewery side to match the doors on the outside dock. I weathered the brick and the interior walls of the office/attic with my India Ink alcohol mixture to give it a worn look." 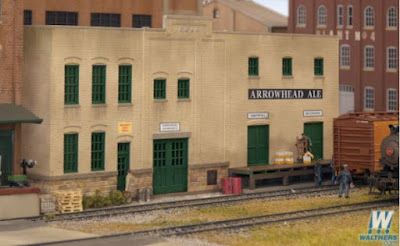 "I searched the Internet for HO scale brewery equipment and office furniture. I found the brewery equipment shown that include a distillery, bottling machine and washing stand. I found swivel office chairs, a roll top desk, and another desk to furnish the office. The brewery equipment included cases with bottle and individual bottles. If you look closely, you can see an individual bottle in front of the green case on the floor near the bottler. Some barrels and boxes in the attic finished the furnishing. One office chair broke but it was painted and put in the attic awaiting repair. A couple of figures added life to the scene." Stay tuned for additional posts on the construction of this year's Jubilee of Trees model railroad.